When analyzing these comics, it is of importance to acknowledge who was actually reading them. In this case, Canadian children were the target audience. Children during World War II are often overlooked in the research of this time period; when conducting research and sifting through information, it is apparent that the search for testimonies of the Canadian childhood experience of this time period was unfruitful. 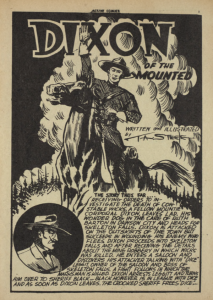 To fill in the missing links of these lost narratives, the Canadian Whites comics will serve as a representative example of the childhood experience during World War II. This is evident from analyzing content of the Canadian Whites’ issue number 22, “Joke Comics” of October and November 1945, with a focus on “Fun Page by Young,” (Young 9); “Izzy Brite,” (Moyer 22-23); “Tangrams,” (Young 39); and “Young’s Whittle Craft,” (48-50). The “Joke Comics” sought to distract children form the harsh realities of the war by offering comic relief and activities within its pages. “Fun Page by Young” is an activity page within the issue that enlists the reader to participate in activities such as crafts or puzzles. Within this comic, there are four different activities such as a drawing exercise, a letter unscrambling activity, a puzzle involving mathematics, and a puzzle asking the reader to find girls’ names (Young 9). This specific activity page also features drawings of puppies, a woman’s face, and a clown. In the “Izzy Brite” comic, the reader is presented with a young boy and his grandfather, a distinct absence of a mother or father. “Izzy Brite” is one of the only comics within this issue that directly references the war. Izzy goes on to make a machine that pitches baseballs, with one baseball hitting his grandfather in the eye, all presumably in good fun (23). Hy, Moyer. “Izzy Brite.” Joke Comics, no. 22, October and November 1945, pp. 22. Canadian Whites Comic Book Collection, 1941-1946. RULA Archives and Special Collections, Ryerson University, Toronto, Canada. The last selection from this comic being examined is “Young’s Whittle Craft” (Young 48-50). This craft asks its young readers to create a wooden dog, including the directions to cut out the dog with a saw. There is no mention of obtaining adult supervision. As well, it asks the children to whittle, sandpaper, and paint the wooden figure (49-50). It is also interesting to note that within many of these comics and activity pages, there is no reference to a stable family life, nor one of nuclear origins. This is seen especially in “Young’s Whittle Craft,” as mentioned previously, the use of a saw is encouraged to complete the craft, yet no parental supervision is proposed. This is linked to events caused by the war. Many family members such as fathers, brothers, or uncles left their homes, disappearing from their young family members’ lives. The “Joke Comics,” rather than provide children with a predominantly masculinized image or dark tropes of life during the war, instead gives children comic relief in the forms of comics such as “Izzy Brite” and giving them time-consuming activities, such as “Fun Page by Young,” “Tangrams” and “Young’s Whittle Craft.” Very few historical narratives of this time period offer a glimpse into the daily lives of young children, nor the effects the war had on them within Canada during this time period. The Canadian Whites offers a glimpse into these lives, as the comics, under much critical analyses, portray a historical narrative all of its own: escaping the bitter realities of war-time life and its trials. The psychology of early childhood is extraordinary in regards to how, at a young age, individuals can employ a framework which guides their sense of worldview and experience, both to subconsciously protect and also give a sense of power over what they are experiencing (Sutherland 29). Sutherland points out in their article Growing Up: Childhood in English Canada that this mechanism is called a ‘script.’ These scripts are used in different circumstances, Sutherland mentions, be it situational or a personal objective. An example of this can be seen in how a family divides the chores and what roles each family member has. Scripts are therefore used to control memory and perception to help develop a process of understanding even the most traumatic circumstances, such as war. Sutherland interviewed many individuals who grew up during the war as young children. One Canadian woman they interviewed identified a memory of her father, who worked as a seaman during World War II, who had passed away, followed by her grandfather just a year later (22). This woman, as a young child, would have employed a specific script to cope with this trauma which was mentioned during the interview. A materialized version of a script is seen within the “Joke Comics” analyzed here. The activity pages use puzzles, trivia, word searches, and fun images to promote an unbiased lens into a realm that children can become fixated or lost in, so as to employ a personal ‘script’ to cope with a sense of confusion to the challenges of the real world. These activities would be time consuming, considering the target age groups of these child readers. An example of this is seen with “Tangrams by Young,” (Young 39). The activity page states the following: “A piece of cardboard is the basis of this little party amusement. Any colour can be used, and to add more effect, any number of coloured cards are used” (39). The “Tangrams” page shows 4 ways the cardboard can be constructed, but allows a creative process of involving more shapes. Made with cheap materials, this project would have been available to any child, even during times of scarcity and ration, encouraging an art form that helps ignore the daily trials of war-era Canada. Service in the military took men from all walks of life away from their families; some were gone since the beginning of the war in 1939 and did not return until its completion (Sutherland 64). Due to the nature of child psychology, it was difficult for these young children to make much sense of the concepts of the external world. Even if they did understand, it would be hard for them to process these patterns of thought. Because of this structure, the family’s home was the centre of balance and sometimes the compass for which they found physical and mental consistency (64). Many times, the removal of the head of the family had devastating effects on the lives of those in the household (Durflinger 169). In many instances, once the war was complete, young children would have barely known or recognized their fathers, or perhaps not even had known them at all (228). This sense of stress and anxiety of both the environment of life during the war, but also the removal of many fathers, father figures, brothers, uncles and cousins would sufficiently cause a decrease in the income of a household and high spirits. In relation to the physical environment of the home during World War II, Canada, although far removed from the conflict, was often fearful of enemy retaliation on home soil. An example of this is seen in Verdun, Quebec that Durflinger ruminates on: an earthquake had “rumbled through the Montreal area on September 5, 1944” (Durflinger 103); incidentally, a mother and her children were discovered in a residential neighbourhood “kneeling on the curbstone praying… at the same time, [they] were shrieking that enemy planes were bombing the city,” (103). Incidents like this were evident every now and then during this time; the stress, fear and anxiety of a troubling time period of housing shortages, food rationing and stamps, and family members suddenly removed from everyday life caused a heightened level of disdain for daily living. This feeling impacted children the most; due to their lack of complete awareness of the outside world, young children looked for forms of distraction that would lighten their spirits and offer a distraction from everyday life. Externally, as children continued on their daily lives, “gradually acquired some sense of the larger circumstances of the world which they lived,” (66). Despite this, these ideologies and experiences of war in Canada only informed what the background of life was on a daily basis. “Izzy Brite,” upon analysis, begs to ask the question of where Izzy’s immediately family is. Only his grandfather is portrayed in this comic, although this is in reference to the specific issue of the “Joke Comics” issue 22. It appears that Izzy is living with his grandfather (or vice versa), as he speaks to his grandfather, who looks as if he is reading a baseball newspaper (Moyer 22). Izzy has enough time and a lack of supervision to create a device that throws a baseball at the hitter; his grandfather loves the idea and goes so far as to give Izzy a nickel for his hard work (22). The end of the comic shows both Izzy and his grandfather with a black eye due to the baseball machine (23). This comic is fascinating in the sense that it seeks to portray, albeit an obviously exaggerated, family dynamic or activity during the war. It is also fascinating due to the fact that it is one out of only a handful of comics that will directly mention the war and even allude to its effects. This is evident when Izzy says to his grandfather in the first panel, “Oh gramp! Is it true, that because of th’ war- A lot of big league baseball players are tired out old geezers” (22)? The font on ‘tired out’ is bold and emphasized. This minimal reference can be alluded to the effects that PTSD had on its military overseas that was brought back home; Izzy is trying to make sense of why the baseball players do not want to play anymore. This would have resonated with many children. These young children would have asked why their family members who had served in the military were ‘acting’ differently, or why things were not the same as they used to be. It is interesting to also notice the war ended September 1945 (Hall). The Canadian Whites’ “Joke Comics” issue 22 was therefore printed after World War II was finished. These activity pages would provide children with an outlet to escape from the reality of having a stranger come home, having their family member home but acting differently, or having no one return home at all. Young, Robert. “Young’s Whittle Craft.” Joke Comics, no. 22, October and November 1945, pp. 48. Canadian Whites Comic Book Collection, 1941-1946. RULA Archives and Special Collections, Ryerson University, Toronto, Canada. This craft, compared to activity pages and comics “Fun Page by Young,” “Izzy Brite,” or “Tangrams by Young,” seem to target an older set of readers; however, this would not stop younger children from attempting this. It would be fascinating to analyze data that acknowledges the age groups of those who attempted this activity and who had helped them complete it, if there were any data sets involving this information in existence. But due to the lack of its existence and considering the target readership, many young children would have conducted this project on their own, a lack of supervision would have been apparent. Although children did not have a large understanding of the goings-on of the ‘real world,’ as Sutherland has noted, they did realize events that made the war real to them. An example of this can be seen in a report that Gwyn compiled of experiences that young children had during the war: “The events that made the war real for me was when [I] was 7; a friend’s brother drowned in the S.S. Caribou passenger ferry to Canada [which] was sunk by a U-Boat in the Cabot Strait…” (Gwyn). This incident created a real-life awareness that would have been hard to process for a young child. Children through time have been “used as visual metaphors and icons in major wars…” (Glassford). Due to their innocence and the vulnerability which they possess, children are attributed to the empathy of the disastrous effects which the war had on the average Canadian citizen. Gwyn writes in regards to the young children left on the home front were “too young… to have fought, but not yet old enough to have forgotten,” (Gwyn). Many of these children reading the “Joke Comics,” although creating scripts to help them acknowledge what their realities were, also could understand the effects the war had. This caused a sense of fear and anxiety, as well as a need to escape the bitter existence of life on the Canadian home front. The “Joke Comics,” specifically issue 22, seeks to recognize the effects the war had, while also capitalizing on WECA. The creation of these light-hearted comics and time-consuming activity pages established a form of creativity and an outlet for children to become lost in, allowing the escapist mentality aforementioned to flourish. The obvious climate of fear, stress and anxiety during the war created a cocktail of emotions for young children to work through. By engaging with the “Joke Comics,” these children are able to divulge in an activity or get lost in a ‘funny’ comic that provides them with humour-centric relief, instead of using strong imagery and tropes of the war. “Izzy Brite,” “Tangrams,” Young’s Whittle Craft and “Fun Page by Young” all seek to provide a form of mental relief. In this aspect, this mode of escapism not only encouraged its readers to ignore the troubling effects the war had, but to also encourage learning, humour, and creativity; the comics, in this regard, would have had success in doing so. Durflinger, Serge M. Fighting from Home: The Second World War in Verdun, Quebec. UBC Press, 2006. Glassford, Sarah. “Practical Patriotism: How the Canadian Junior Red Cross and its Child Members Met the Challenge of the Second World War.” The Journal of the History of Childhood and Youth, vol. 7, no. 2, Spring 2014, http://muse.jhu.edu.ezproxy.lib.ryerson.ca/article/545838. Accessed February 18, 2017. Gwyn, Sandra. “Too Young to Fight: Memories of Our Youth During World War II.” The Globe and Mai, November 6, 1999, http://search.proquest.com.ezproxy.lib.ryerson.ca/docview/384377549?pq-origsite=summon. Accessed March 22, 2017. Hall, Michelle. “By the Numbers: End of World War Two.” CNN Library, September 2, 2013. http://www.cnn.com/2013/09/02/world/btn-end-of-wwii/. Accessed March 22, 2017. Hy, Moyer. “Izzy Brite.” Joke Comics, no. 22, October and November 1945, pp. 22-23. Canadian Whites Comic Book Collection, 1941-1946. RULA Archives and Special Collections, Ryerson University, Toronto, Canada. Kocmarek, Ivan. “Truth, Justice, and The Canadian Way: The War-Time Comics of Bell Features Publications.” Canadian Review of Comparative Literature / Revue Canadienne de Littérature Comparée, vol. 43, no. 1, March 2016, pp. 145-65. Project Muse, https://doi.org/10.1353/crc.2016.0008. Accessed February 18, 2017. Sutherland, Neil. Growing Up: Childhood in English Canada from the Great War to the Age of Television. University of Toronto Press, 1997. Young, Robert. “Fun Page by Young.” Joke Comics, no. 22, October and November 1945, pp. 9. Canadian Whites Comic Book Collection, 1941-1946. RULA Archives and Special Collections, Ryerson University, Toronto, Canada. Young, Robert. “Tangrams.” Joke Comics, no. 22, October and November 1945, pp. 39. Canadian Whites Comic Book Collection, 1941-1946. RULA Archives and Special Collections, Ryerson University, Toronto, Canada. Young, Robert. “Young’s Whittle Craft.” Joke Comics, no. 22, October and November 1945, pp. 48-50. 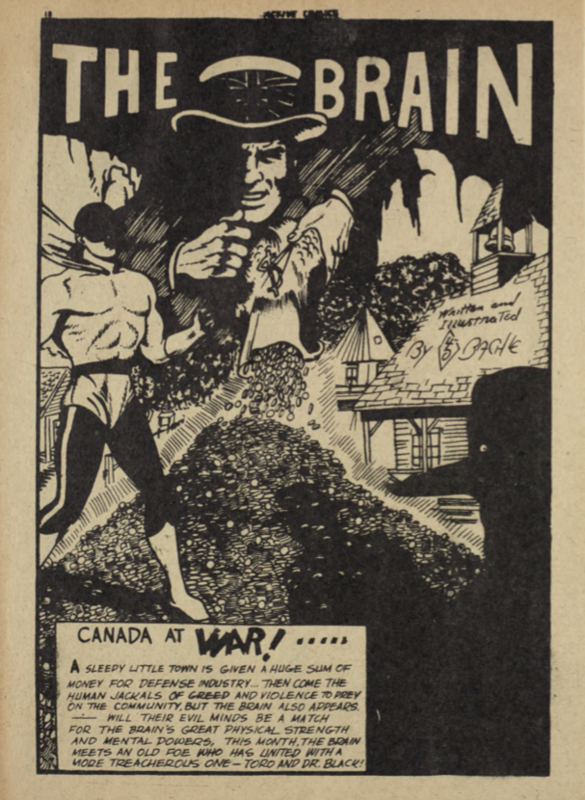 Canadian Whites Comic Book Collection, 1941-1946. RULA Archives and Special Collections, Ryerson University, Toronto, Canada.